This is the website for all things Conestoga Valley Baseball. Check back often for up to date news and information on CV baseball. Coming off Easter Weekend, one week into the travel season, and one week away from the start of rec season, we hope you're in full base ball mode! Here are a few updates we wanted to get in front of you. Please note they are time sensitive. Conestoga Valley Baseball will be holding Opening Day on Saturday, April 27, 2019 at 9a at the Witmer Heights Mennonite Church Fields. We look forward to having our Tee Ballers through Varsity Players all on hand in full uniform to celebrate the 2019 Spring Season for Conestoga Valley Baseball! Please plan to have your player there around 8.45a to meet up with your team along the 1st Base line near the outfield entrance to the Witmer 1 Field. We’ll begin promptly at 9a. Please don’t park in the front of the church as it is reserved for WHMC. Additional parking can be found at Locust Grove Mennonite School across the street. We’ll have a great Opening Ceremony and then get you off to games starting at 10a. This year, as in past years, CV Baseball will be selling R&K Subs and Sandwiches! We will have a full month to sell and help raise funds for the CV Baseball. The fundraiser is a HUGE part in covering the expenses of the program so we can keep registration fees low. Please be sure to have your orders AND money turned in to Andrea Mull by May 5th at 5 pm (this is a Sunday). I will be at Witmer fields until 7:30p on May 2nd if you wish to turn everything in then, otherwise, please make arrangements. Checks can be made out to CVBA. Please have all totals written on your sheets, and the money along with it in an envelope. This will help us to stay organized. Please also put your contact phone number and your child's name and team on the form. Click HERE for the sub form. Let us make this the BEST R&K Subs fundraiser CVBA has ever had! Save the date of Friday, June 14, 2019 for CV Baseball Night at the Barnstormers. Join us for a game of baseball and a fun night celebrating CV Baseball and the Lancaster Barnstormers. Details to follow. We hope the start of the Spring 2019 is going well. We see that our fields are all full of our young players getting ready for the season. It's a fun time for all of us training and anticipating the start of gameplay. We need your pictures for our 2019 Spring Program. Please submit your baseball pictures from the last season (or earlier) to our Jot Form upload site. We need your pictures ASAP so the deadline will be at the end of next weekend (Sunday, April 14th). The Elite Baseball 4-day youth summer camp is designed to help players of all ages and abilities learn the core fundamentals of the game. The camp emphasis will be teaching proper hitting mechanics, proper throwing techniques and live game situations. As always, reach out w/ any questions or concerns. We'll see you on the fields. It's hard to believe we're just a few short weeks from the start of our 2019 Spring Baseball Season. This email is to provide you with some key information for this upcoming season. Travel teams have all been announced. 10U Rec, Rookies, and Tee Ball teams are being assembled. We need coaches for 10U Rec. Please reach out to us if you're interested in coaching. We would like to get teams announced in the next week or so. The weather will play a large part of how soon we'll be on the fields. Your coach will be communicating the schedules and locations for practices once they are determined. Spring training will begin no later than the last week of March, but may start sooner for our travel/older teams. Field Day will be Saturday, March 23rd at 8a. We will announce where to go once we get closer to that date. Many hands make for light work. If you can give an hour, we'll take it. We're thinking through ways to make it as efficient as possible. We're also excited about some improvements we're making to the Witmer complex for our 10U players. Conestoga Valley Baseball will be holding Opening Day on April 27th at 9a at the Witmer Heights Mennonite Church Fields. Even though games in the LCYBL will have started, this Opening Day event is for the whole program. Don't forget to head over to Funck's tomorrow for the all-you-can-eat Pancake Breakfast in support of our Baseball Boosters. We look forward to a developmental, competitive, and fun spring baseball season, as well as some warm, dry weather! Call it a pancake, flapjack, griddle cake, or hotcake, but head to Funck's for a delicious breakfast in support of our High School Baseball program. This is to remind you of our Winter Workout tonight at @ Spooky Nook as well as on 3/2 and 3/9 @ Keystone Baseball Academy. Please note that the times on 3/2 have changed! We're all anxious to find out our player's team and coach. However, in an effort to make sure we've placed all the players on the right team, Winter Workouts factor into evaluations. Please make it a point to get your player to tonight's workout if possible. Final team selections will not be made until the end of February. Specific to Nook Sports, please get a parking voucher from a CVBA board member or coach the night of Winter Workouts. Otherwise, you'll pay to park. You'll want to get there 30m early to walk in from the parking lot and be ready to go right on time. At Keystone the lot is adjacent to the facility and there is no cost to park. We're just two days away from the 2019 Baseball Bingo event sponsored by CVBA. Come Bingo. Bring Friends. 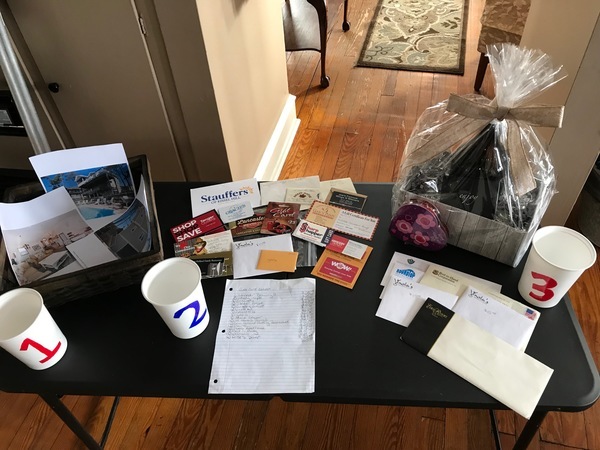 Buy Tickets for Awesome Prizes. HAVE FUN! 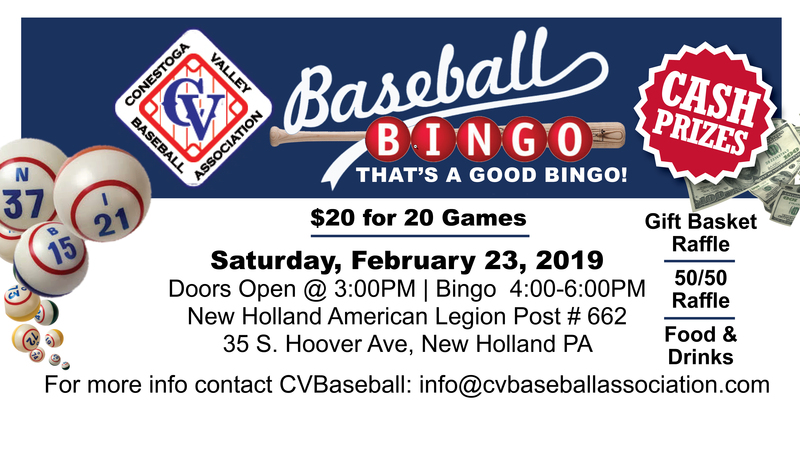 Handout the Flier, grab a few friends, and come to the American Legion Post #662, 35 South Hoover Ave, New Holland, PA Saturday, February 23, 2019 from 4p to 6p (doors open at 3p) for BASEBALL BINGO! ...And just to get you pumped up for some of the cool stuff you can win, here is a sneak peak at some of the $10 Ticket Baskets. It's time for CVBA's Annual Baseball Bingo. There will be Cash Prices, Gift Basket Raffle, 50/50, Food & Drinks, and of course Bingo! This is a family friendly event that is open to the public in support of Conestoga Valley Baseball. This event plays a HUGE role in raising the funds to support the baseball programs in CV. Come on out if you love baseball, or Bingo, or the kids in the community, or to have a great time winning prizes! Join us on Saturday, February 23, 2019 from 4p to 6p (doors open at 3p) at the American Legion Post #662, 35 South Hoover Ave, New Holland, PA. Download our Flier to hand out to your friends and remind yourself to join us for a great night of fun! There is still time to register your player for Tee Ball, Rookies (Coach Pitch), and 10U Rec. Registrations will remain open until the end of February! Head over to register spring baseball! Thank you for being volunteering to coach this spring season. We are still actively working through the evaluations from the last two Saturdays as well as preparing for the Winter Workouts. Though we have not made final decisions on players or coaches, we need your help in finalizing our rosters. Please make it a point to attend the Winter Workouts to assist in facilitating the drills and practices for our players. Final Team rosters and coaches for all levels and sections will be announced by the end of February. You are receiving this email becuase you denoted your desire to coach when registering your player. Please make sure you have filled out our Coach Application and that you have uploaded your clearances in Stone Alley. The Lancaster Barnstormers are offering a Youth Coaches Clinic on Saturday, February 9th from 9:00 a.m. to 12:00 p.m. This clinic is free to area youth coaches. CVBA coaches, this is a great opportunity to get some coaching insights from a great baseball organization. Mark your calendars. Visit Lancaster Barnstormers for more information on the clinic (lancasterbarnstormers.com/youth-coaches-clinic). All 10U Players (Rec and Travel), times have been emailed to you for evaluations on Saturday, February 2nd. Check your email! There is only TODAY left to register for the 2019 Spring Baseball 10U, 12U and 14U travel programs. All players MUST register prior to evaluation. Tee Ball, Rookies, and 10U Rec registrations will remain open through February 28, 2019, but register by day's end to avoid the $20 late fee. Please head over to conestogavalleybaseball.com/registration to sign up for the Spring 2019 Season. Any players 10U Travel and Up MUST be signed up before January 25, 2019. Times have been communicated to 14U and 12U players for evaluations on Saturday, January 26. Times will be communicated to 10U players closer to Saturday, February 2. Please let us know if you have any questions or concerns about registration or evaluations. Join us for CVBA's Annual Baseball Bingo. There will be Cash Prices, Gift Basket Raffle, 50/50, Food & Drinks, and of course Bingo! This is a family friendly event that is open to the public in support of Conestoga Valley Baseball. The Lancaster Barnstormers are offering a Youth Coaches Clinic on Saturday, February 9th from 9:00 a.m. to 12:00 p.m. This clinic is free to area youth coaches. CVBA coaches, this is a great opportunity to get some coaching insights from a great baseball organization. Mark your calendars. Visit Lancaster Barnstormers for more information on the clinic (lancasterbarnstormers.com/youth-coaches-clinic). With the evaluations and winter workouts soon approaching, we are looking to firm up our travel coaches for the 2019 Spring Season. Please make sure you let us know if you would like to coach by filling out our Coach Application as well as denote your desire to coach when registering your player. To be considered for coaching, you must fill out the application by January 19, 2019. All clearances must be submitted prior to assessments on January 26, 2019. Recreation coaches sill have more time. If you have any questions about being a coach for our 10U, 12U and 14U travel programs, let us know by emailing info@cvbaseballassociation.com. Coaches...if you have interest in coaching, please make sure you're signing up to coach when registering your player as well as filling out the coach application. More information can be found on our Coaches section of our website. The deadline to be considered for coaching in our 10U to 14U levels is January 19th! We hope you're enjoying the first full week of the new year. We're actively planning the Spring 2019 Baseball Season so we thought we'd take this chance to remind you to register your player and give more details for evaluations. Please note the dates as we have split the evaluations over two days to allow us more time to evaluate all players. Please head over to conestogavalleybaseball.com/registration to sign up for the Spring 2019 Season. Any players 10U Travel and Up MUST be signed up before January 25, 2018. A more specific time slot for each age group will be emailed out closer to the date. All players should arrive 15 minutes prior to their timeslot to check-in. Player evaluations will last approximately 90 minutes. If you are unable to make your time slot, please notify us immediately to make other arrangements for the evaluation. IMPORTANT: For all players 12U and 14U (and 10U travel), new for this spring season, the winter workouts will be a continuation of the evaluation process. Therefore, all players are strongly encouraged to attend as many of or all of the winter workouts if possible. Final Team rosters for all levels and sections will be announced in the beginning of March a few weeks prior to the start of outdoor practice. Evaluations are for players only and will be closed to parents/guardians. Players should bring their baseball equipment and, if they have catchers’ gear, please include that as well. Please make sure you let us know if you would like to coach by filling out our Coach Application. as well as denote your desire to coach when registering your player. To be considered for coaching, you must fill out the application by January 19, 2019. All clearances must be submitted prior to assessments on January 26, 2019. That is all for now, stay tuned for more specifics for the evaluations, the team selection process, and make sure you register your player! The 2019 Spring Baseball Season registration is open. Between the holidays is a great time to take care of registering your player baseball! Registrations will be open through January 25th for 10U Rec through 14U Travel. Head over to conestogavalleybaseball.com/registration. 10U Rec and 10U Travel (as well as all other travel) registrants should plan to attend the player evaluations on Saturday, January 26, 2019. It is necessary for all players to participate so we can correctly assign teams. All CVHS 9th Graders still eligible for 14U, please sign up for the spring baseball program and attend evaluations even if the player is planning to try out for Junior Varsity Baseball. In the event a player DOES NOT make the JV team, he will have a place on the 14U roster. In the even he DOES make the JV team, CVBA will issue a full refund for registration. If you have a desire to coach, please let us know ASAP by filling out our Coach Application. To be considered for coaching, you must fill out the application by January 19, 2019. All clearances must be submitted prior to assessments on January 26, 2019.